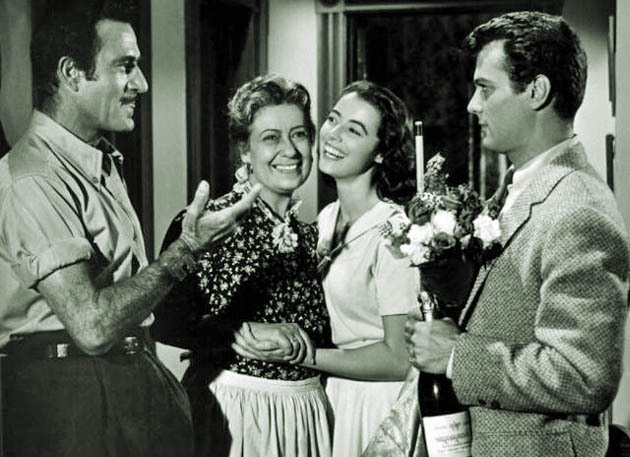 The Midnight Story with Argentina Brunetti, Tony Curtis, Marisa Pavan, and Gilbert Roland. Joseph Pevney directed this 1957 crime drama about a San Francisco traffic cop (Tony Curtis) attempting to solve the murder of a priest. During the course of her film career, Argentina Brunetti was seen – almost invariably in minor roles/bit parts – in nearly 70 features. Actress Argentina Brunetti, a founding member of the Hollywood Foreign Press Association – which hands out Golden Globes on a yearly basis – and a supporting player in Frank Capra's It's a Wonderful Life, died at age 98 in Rome on Dec. 20. Born Argentina Ferrau on Aug. 31, 1907, in Buenos Aires, Brunetti came to Hollywood in 1937 to dub into Italian the voices of Metro-Goldwyn-Mayer stars Norma Shearer and Jeanette MacDonald. She began acting in films about a decade later. Her husband, Miro Brunetti, was a Hollywood-based foreign correspondent. Hence her connection with the founding of the HFPA. In the 1946 Best Picture nominee and (in the U.S.) Christmas favorite It's a Wonderful Life, Brunetti played an Italian immigrant, Mrs. Maria Martini, whose family, with the assistance of the small-town financial institution co-owned by George Bailey (James Stewart) buys a home of their own – thus finally getting the chance to move out of the slum dwelling belonging to the avaricious banker/slumlord Mr. Potter (Lionel Barrymore). In addition to Frank Capra's sentimental fairy tale, Argentina Brunetti was seen in dozens of Hollywood releases, usually as uncredited, Italian- or Spanish-named mothers and grandmothers, with the occasional Native American thrown in. Among her movies are Gilda (1946), California (1946), Shockproof (1949), Broken Arrow (1950), When in Rome (1952), The Caddy (1953), and The Brothers Rico (1957). Her last big-screen release, Harry Basil's The 4th Tenor, starring Rodney Dangerfield, came out in 2002. Brunetti also appeared in numerous television shows, including The Untouchables, Kojak, and Everybody Loves Raymond. Argentina Brunetti was one of the last surviving adult cast members of It's a Wonderful Life, which, as per the IMDb, had its initial release on Dec. 21, 1946 – almost exactly 59 years before Brunetti's passing. The only surviving adult It's a Wonderful Life performer is Virginia Patton (born on June 25, 1925), who plays Ruth Bailey in the film. Following Capra's effort, Patton was seen in only four movies, the last one being Lewis R. Foster's 1949 crime comedy The Lucky Stiff, toplining Dorothy Lamour, Brian Donlevy, and Claire Trevor. Charlotte Rampling in Twice Upon a Time: Veteran international cinema actress to head Berlin Film Festival Golden Bear jury. In movies beginning in the mid-1960s (The Knack… and How to Get It, Georgy Girl), Charlotte Rampling has been a steady toiler since then, being featured in leads and top supporting roles in more than 50 big-screen releases on both sides of the North Atlantic. These range from Luchino Visconti's rococo The Damned and Liliana Cavani's gloomy The Night Porter to Woody Allen's 8½-esque Stardust Memories and Sidney Lumet's box office hit The Verdict, and on to François Ozon's Under the Sand and Swimming Pool. Luchino Visconti's Nazi era-set The Damned (1969), supporting Helmut Berger, Dirk Bogarde, and Ingrid Thulin. Liliana Cavani's Nazi era-set The Night Porter (1974), co-starring Dirk Bogarde. John Boorman's sci-fi fantasy Zardoz (1974), opposite a colorfully clad Sean Connery. Woody Allen's Stardust Memories (1980), as one of the women (along with Marie-Christine Barrault and Jessica Harper) in the life of troubled, 8½-esque filmmaker Allen. Sidney Lumet's The Verdict (1982), in which she delivers a first-rate performance as the woman who becomes involved with down-on-his-luck attorney Paul Newman. Alan Parker's supernatural suspense drama Angel Heart (1987), with Mickey Rourke, Robert De Niro, and Lisa Bonet. Gianni Amelio's family drama The Keys to the House (2004), opposite Kim Rossi Stuart. François Ozon's Under the Sand (2000) and Swimming Pool (2003). In the latter film, the 57-year-old Rampling has a memorably daring moment, lying fully naked in bed while Ozon's camera lingers on her. The French-based Rampling has never been nominated for an Academy Award or a BAFTA, but she has been shortlisted for three Best Actress Prix César: He Died with His Eyes Open (1986), Under the Sand (2001), and Swimming Pool (2003). Additionally, in 2001 she was handed an Honorary César for the bulk of her film career. This year, Charlotte Rampling has been nominated for the Jameson People's Choice Best European Actress Award for her work in Dominik Moll's Lemming. The winner will be announced at the Dec. 3 European Film Awards ceremony in Berlin. Argentina Brunetti, Gilbert Roland, Tony Curtis, and Marisa Pavan The Midnight Story image: Universal Pictures, via Pinterest. Charlotte Rampling Twice Upon a Time image: Gaumont / Columbia TriStar Films. 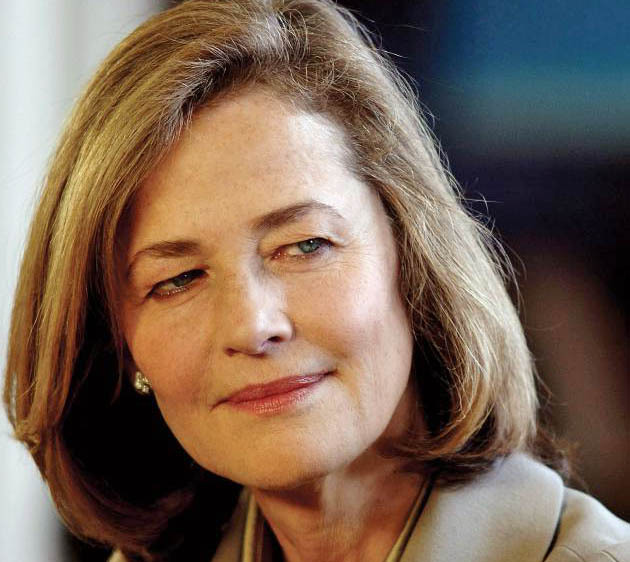 “Argentina Brunetti: It's a Wonderful Life Actress + Jury Prez Charlotte Rampling” last updated in January 2019.